(Birdsfoot Trefoil, Orange (Lotus corniculatus) - 01) We spotted this orange birdsfoot trefoil growing along the side of the road, on the edge of a patch of the typical yellow flowered birdsfoot trefoil. This was the first time we had ever seen this variety, and the literature didn't mention this color. 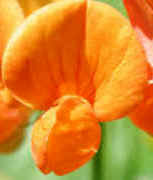 The only reference we found mentioned that the flowers of the birdsfoot trefoil are sometimes tinged with red. Everything else about this wildflower appeared to be the same as the typical yellow birdsfoot trefoil. (Birdsfoot Trefoil, Orange (Lotus corniculatus) - 02) Since these orange birdsfoot trefoil were growing with the yellow ones, they would share the same characteristic of blooming from June to September. They also have the same sized and shaped 1/2 inch flowers, and the same leaf structure. 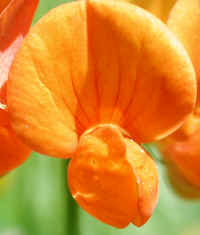 (Birdsfoot Trefoil, Orange (Lotus corniculatus) - 03) This is a close-up, side view of the orange flower of this variety of birdsfoot trefoil. (Birdsfoot Trefoil, Orange (Lotus corniculatus) - 04) This is a bee's eye frontal view of the flower of the orange birdsfoot trefoil. 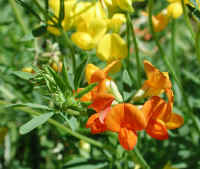 Birdsfoot trefoil is a member of the pea family. 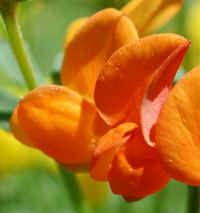 (Birdsfoot Trefoil, Orange (Lotus corniculatus) - 05) This photo was sent to us by Shaun D. Abbott, with our thanks. 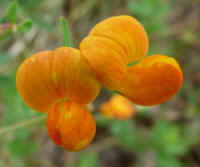 He wrote, "I also found some orange birdsfoot trefoil - two isolated flowers in a field of the yellow flowers (waste-ground in Montreal West-Island suburbs, Québec, Canada).